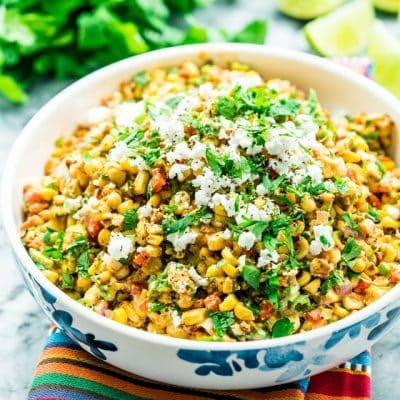 This Mexican Street Corn Salad, also known as Esquites, is smoky, spicy, tangy and incredibly delicious. If you love the Mexican corn on the cob then you will love this version. Happy Cinco de Mayo, friends! I just love to celebrate this holiday because I think in another life I was born Mexican because I really really really love Mexican food! It’s my favorite, in fact. I would be happy cooking Mexican food every single day, not only cook it but eat it as well. 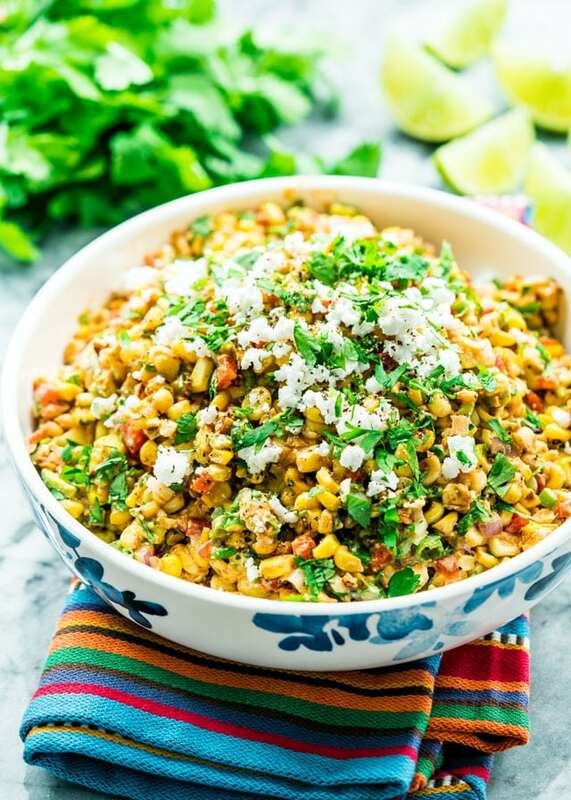 For this Cinco de Mayo though, I have a wonderful Mexican street corn salad to share with you, which is known as Esquites or vasito de elotes which literally means little corn-cup. 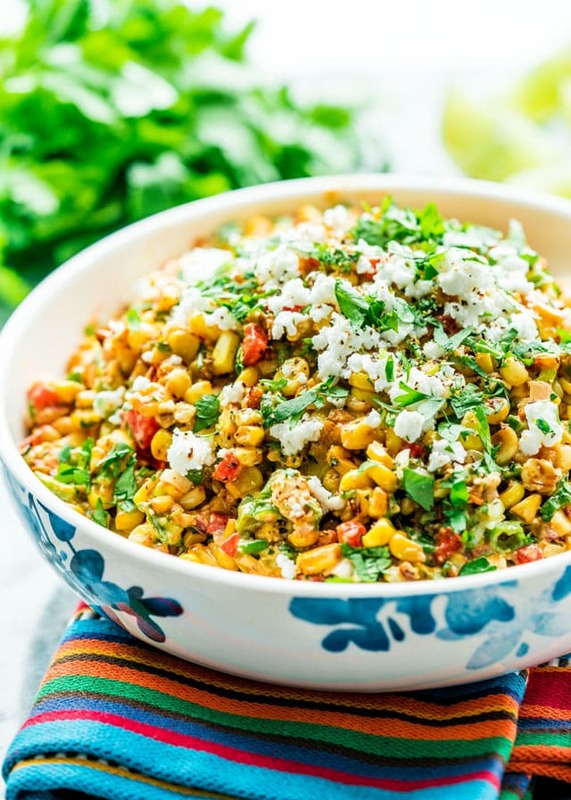 Esquites is usually made with corn sautéed in butter with onions, chiles and salt, then served in a cup and topped with various combinations of lime juice, chile powder, hot sauce, salt, mayo, etc. My version here is similar but a bit different. 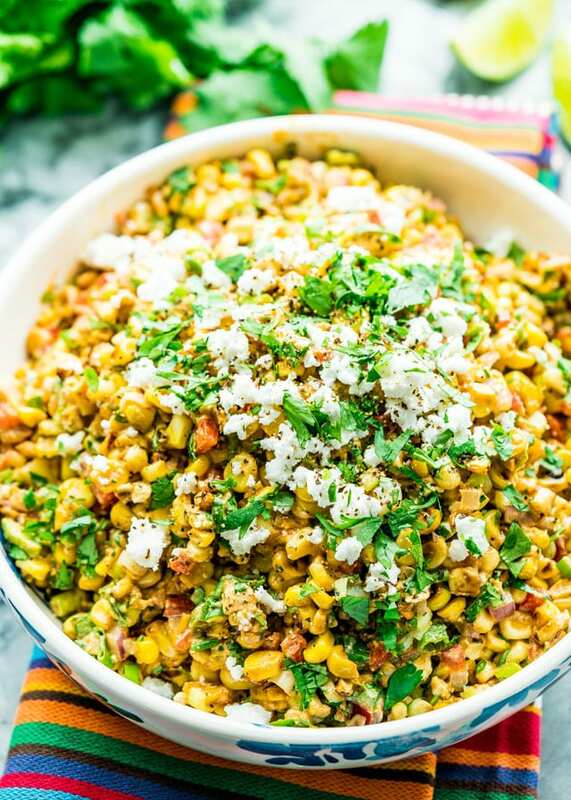 I like to add a few extra ingredients to my corn salad because I like to serve and eat this as a meal rather than a side, which it could totally be. The extra ingredients I added are some red bell pepper, some green onions, a little bit of avocado and lots of feta or cotija cheese. I usually end up adding feta cheese because I usually have a hard time finding cotija cheese, which is basically a Mexican version of feta, a bit less salty. I love both, so I don’t mind adding either cheese. I did use fresh corn, although traditionally mature corn is used, which is first boiled in salted water, then sautéed in butter. 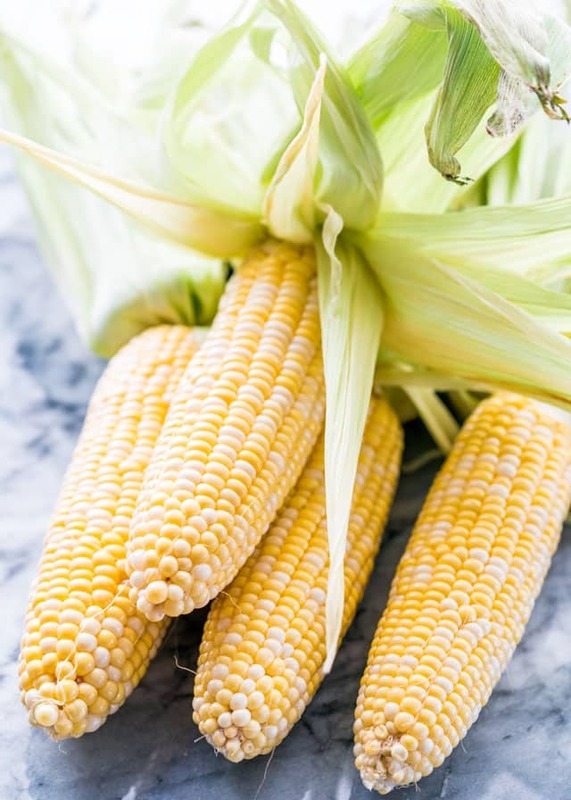 If you don’t have fresh corn, you can go ahead and use either frozen or canned. Sautéing the corn first really brings out its sweetness. There are, of course, a couple ways you could do this. One way is to fire up your grill and grill your corn until it’s nice and charred on the outside. I love to just cut the corn of the cob and then sauté it with a bit of oil in a skillet over high heat until you get a nice char on the kernels. Either way works. Hope you give it a try, it really is wonderful and like I said, I love having a big bowl of this salad as my lunch or dinner. It really is yummy! Cut the corn off the cob. I used 5 ears to get about 4 cups. You can also use canned corn or frozen corn. If using frozen, no need to thaw it out. Heat the olive oil in a large skillet over high heat. Add the corn and stir it around. Cook for about 3 to 5 minutes or until the corn starts to char, which is why we're using high heat. If using frozen corn, you will need a couple minutes extra to get the right charred bits. Transfer the corn to a large bowl and let it cool for a couple minutes. To the same bowl, add the remaining ingredients. Stir everything together until well combined. Adjust lime juice and salt and pepper as necessary. To serve garnish with additional cheese and cilantro, if preferred. I usually make this with feta cheese since I always have a hard time finding Cotija cheese, which is a Mexican cheese similar to feta. Is this supposed to be served warm or cold? I’ve seen similar recipes that specify cold. I’m taking it to a potluck and wanted to check. Tried a few of your recipes shared by other subscribers, delicious and would appreciate being accepted as a subscriber myself. Thank you. Delicious. Made to accompany pulled pork at a dinner party and it worked really well. I followed the recipe but found there was too much dressing to pork ratio so added another cup of corn. Will make again! And everyone at the dinner party has asked the recipe which means it must have been a hit. Great recipe!! I would however make it without the mayonnaise and sour cream next time. It was actually creamy enough with the avocado and the crumbled feta cheese. The taste was amazing, and I would say the smoked paprika had a big role in making the dish super special. Can’t wait for my guests to try it later tonight. Has anyone made this the night before serving? Or even the early morning before dinner? I’m bringing it to my sisters house for dinner, but have to work all day. As long as you keep it in an airtight container, it will keep well in the fridge! Look great! Look very delicious! I love that! The very useful instructions in your post with me! Thank you for your post! Yum! Really good!. I did add a little Red Cayenne Pepper add the end but not because it needed more flavour – I just crave a little kick sometimes. This recipe is delicious. Made it 2x in 2 weeks. Thanks for sharing. I can’t find fresh corn this time of year. I am going to use fire roasted can corn. Do I drain it? Canned or frozen corn will work! Yes definitely drain it if you use canned. I had to use frozen corn and still turned out amazing! I used both cojita and feta for depth of flavor and sprinkled tajin seasoning over the top before serving. My boys each ate several servings and largely ignored the rest of the meal. I omitted avacado because we don’t care for it. Will be making again soon! I’ve made this recipe three times now! I love it. I haven’t added avocado yet because I’ve taken it for potlucks and I didn’t want to avocado to turn brown. It is super popular. A crowd pleaser. So happy you like it, Martha! This is so delicious and was a big hit at yesterday’s cookout! I have sent out links to the recipe already this morning. I plan to make another batch this weekend for lunches this coming week. I made a few changes to it, based on what I had on hand and the fact that I was making it several hours ahead to take to a cookout. I used 6 ears of corn instead of four and had grilled them. We had just roasted a bunch of Costa Rican sweet peppers out on the grill so I peeled a couple and used those instead of raw. I had tons of grape tomatoes from the garden so I added those along with a can of rinsed black beans. I omitted the avocado because I was making it hours ahead of time and wasn’t sure there would be enough dressing to keep them from browning. For the dressing, I used ground ancho chiles instead of smoked paprika (mainly because I couldn’t find my paprika). And I used 4 T of olive oil mayonnaise of part mayo and part sour cream/yogurt. I did use cotija cheese because it’s now available at my grocers, and I think a dash of Tabasco would have been nice for just a bit more warmth. I think this would work really well with some protein added, such as chicken, to become a lunch or main dish salad. Even without some chicken, the serving sizes are hefty and would be satisfying. That’s what so great about cooking, you can customize recipes are you choose and based on what ingredients you have in your home. Especially salads such as this. Glad you guys enjoyed it! Oh my goodness….this recipe is great and simple. I grilled the corn and poblanos peppers (can’t eat red,green,orange or red peppers) and I skipped the cilantro and used cotija cheese.